That’s all that stood between the Wellington Dukes and perfect weekend. Well, that and a Prince Edward County native that might be the best puckstopper in all of Junior A hockey in Canada. The Wellington Dukes (16-13-3, 35 points) managed to grind out a pair of clutch East division road victories this weekend but couldn’t quite turn the trick at home. 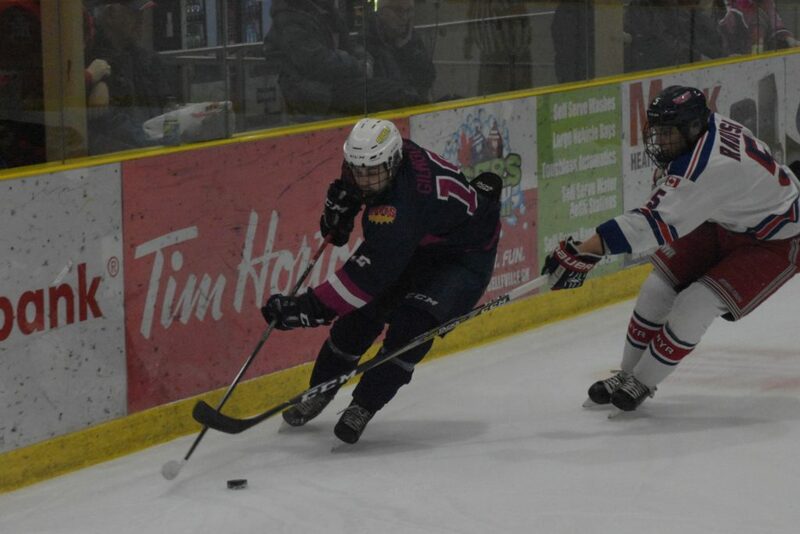 After besting the Voyageurs in Kingston on Thursday, the Dukes returned to Wellington on Friday and took a 2-2 draw against the North York Rangers into the third period. 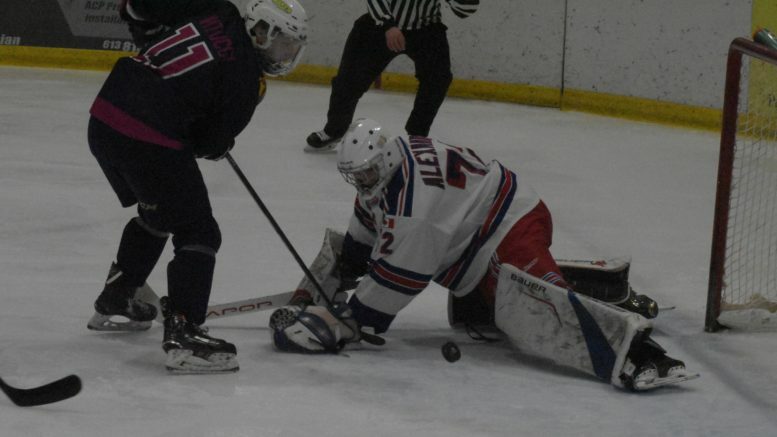 Wellington would end up falling 4-2 to the visiting blue shirts and their netminder Jett Alexander but rebounded nicely on Sunday to blank the host Trenton Golden Hawks 2-0 to make it a winning weekend for the locals. Overall, Wellington Dukes bench boss John Druce was satisfied with the his club’s efforts. By scoring four out of a possible six points, fourth place Wellington was able to put some distance between themselves and fifth place Kingston and were able to draw even with the Golden Hawks in number of wins with 16. But more than that, Wellington continues to show commitment to structured play in their own end. That, and starry netminding on the part of Olivier Lafreniere has led the Dukes to a 6-2-0 record over their last eight games. I thought we played very well, we came out playing the right type of hockey right from the start in Kingston,” Druce told the Gazette Monday. Wellington defenceman Brett Humberstone would stake his club to a 1-0 part way through the first on Thursday night at the Invista Centre as Wellington out shot the hosts 8-7. In the second, a shorthanded goal by Adam Kim at 4:24 could have upset Wellington’s apple cart but the locals were able capitalize on Max Emelifeonwu’s hooking minor less than a minute later as Ben Woodhouse’s effort beat Kingston starter Alexei Masanko to make it a 2-1 lead. Just over three minutes later, Woodhouse and Quinn Hanna would each draw an assist for their second points of the night in support of Frank Vitucci’s 11th of the season that pushed Wellington ahead by two. In case Kingston was thinking of a late game charge, Dylan Massie fired home a powerplay goal with less than 10 minutes left in the contest with Woodhouse and Ben Roger drawing assists. Massie and Woodhouse would pick up three points a piece in the contest and Lafreniere made 30 stops in the win. On Friday, it was a goaltenders battle as Prince Edward County’s Jett Alexander and Lafreniere made a number of dazzling stops especially early on as the game remained scoreless through the first. In the second, the teams traded goals. First, it was Aiden Casey catching Lafreniere going the wrong way and sending the puck into the Wellington net at the 2:05 mark. 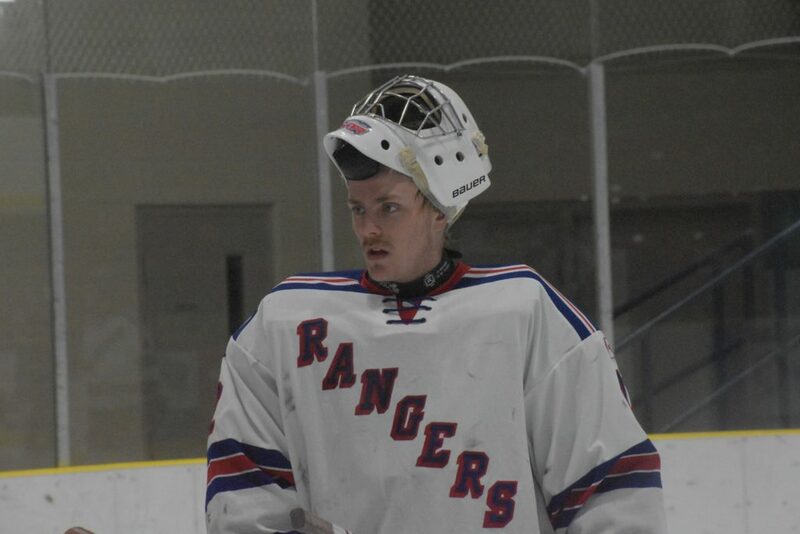 The game stayed at 1-0 until midway through when Andrew Rinaldi would bust towards the North York net while Wellington was enjoying a powerplay. Rinaldi’s 19th of the season tied it up at 1-1. That tie lasted just under four minutes as Ryan Radisa’s goal off a broken play in front of the Wellington net let North York once again gain an edge. The Dukes did respond before the end of the frame as a give and go play in the Rangers end allowed Tyson Gilmour to slide the puck to the far post and past Alexander with just 47 seconds left in the period. The game remained tied past the 54th minute until the highly ranked Rangers caught a break. After setting up both Rangers tallies, Ross Krieger finally solved Lafreniere himself at the 14:19 mark to push North York ahead 3-2. A Joey Maziarz empty netter with under a minute to play dashed any hopes of a Wellington comeback. That work ethic that was brought forth in Wellington’s games on Thursday and Friday was evident on Sunday night as the Dukes paid their third and final visit to Trenton. Dukes blueliner Tim Fallowfield’s blast off a feed from Elijah Gonsalves with under three minutes left in the first period was all the offence Wellington was going to need on this night as Lafreniere was simply sensational, foiling the Golden Hawks at every single turn. Trenton, afforded five powerplay chances to Wellington’s two, came up dry every time with man advantage including a full, two-minute five-on-three chance early in the third period. The ‘we’ includes their netminder. “When Ollie’s getting on that role, he’s very hard to beat,” Druce added. Wellington will welcome a pair of Toronto teams to Lehigh Arena this weekend. Recent University of Michigan commit Eric Ciccolini and his Junior Canadiens are in Wellington on Friday night while the Patriots visit on Sunday afternoon. LEDES AT LEHIGH: Friday night marked Pedal for Hope and Childhood Cancer Awareness night as the club donned special jerseys and hosted a silent auction. Local cancer survivor Abigail Heffernan dropped the puck during a ceremonial faceoff and the 50/50 proceeds were donated to the Pedal for Hope campaign.